When I saw this gorgeous cover I knew I had to read the book. Then I read the summary and fell in love. And then it was on NetGalley. And I had to request it. So happy that the publisher approved me. <3 Took me some weeks to start reading it, but today I finally did. And it was so worth it. I adored it a lot. I'm not sure how to begin talking about this book. First I want to mention that the writing is beautiful. I really loved it. It made the story come alive for me. Then there are the characters. I adored reading about them all. Especially Ned. I loved that the book is told from many different point of views. I just loved so much about this book. And I won't talk too much about it. Because it felt so short while I read it. And I don't want to say everything that happens. Just a few small things that I really adored. First, I really loved Ned. Though the beginning of the book.. it is heartbreaking. We learn that Ned had a twin; Tam. That he died when they were very young. He drowned. And we get to read that scene. And it was so sad and so real and I loved it to pieces. Then we get to know their mother, who is called Sister Witch. Because she kind of is a Witch. And I loved getting to know her a little too. She was awesome. But their dad. Sigh. I don't know. I liked him later in the book. In the beginning he just seems so broken. And I couldn't be sure whether he loved Ned or not. But I do know that he did. I do. And I did like him. For the most part. Because you see. Life for Ned is not all that good. He has his mom and his dad. But he has no friends. It's been many years since Tam died. And his mother did something terrible. Yet also beautiful, because it kept Ned alive. But oh. So heartbreaking as well. Sniffs. Anyway. Ned cannot speak much, because he stutters. And he is very weak. And it is so heartbreaking. And everyone in the village is saying that the wrong boy survived the river that day. And it made me so angry and so sad. Yet it was amazing to read. But then there was Áine. And oh, I really did love her. Though I was a bit unsure about her sometimes, as she seemed a bit cold. But we got to know her a little better and I started to like her a lot. I loved the starting of the friendship between her and Ned. It was sweet. But sniffs. I would have liked the book to be longer. I would have liked to get to see more of it. Sigh. But anyway. It was enough. Because Áine was an amazing character. As was Ned. And the wolf. And just about everyone. Sigh. Oh, how I enjoyed this. There is magic in this book. And it is amazing. It reminded me a little bit about The Thickety, which I loved. But at the same time it was very different from it. Which made me happy. Because I love both books now, hih. Anyway. The magic. It speaks. And it was a bit creepy. Yet all kinds of awesome. I really enjoyed reading about it. Though it did do some awful things. Sigh. But anyway. I found The Witch's Boy to be a beautiful book. Full of adventure, friendship and heartbreak. This book just made me so happy. Though there was this one thing. And I cannot decide how I felt about it. Okay, fine, it broke my heart a little. So this small part will be spoilery. Just a warning. It is about the ending. First, I loved the ending. But. A whole year went by. And Áine and the wolf just left Ned. Then came back. And it broke my heart. Because he was so sad and dreaming about them and it broke my heart into a million pieces. Oh, I need a sequel. I need to read about Áine making up to Ned for leaving. And I might want some romance, hih. 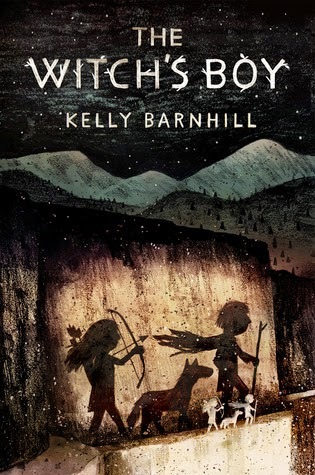 Huge thank you to the publisher, Algonquin Books of Chapel Hill for accepting my request to read and review The Witch's Boy early via NetGalley. <3 I'm so glad I got to read it. And I cannot wait for September to arrive, so that I can own it in hardcover as well. Because this book is gorgeous. And the story is stunning. I suggest that you all read it when it comes out. Or go request it on NetGalley. Because it is worth it. Despite my heartbreak about the ending, lol. It is such a beautiful story. I loved it a lot. I need to add this to my TBR, an awesome cover and a great story!? I can totally understand your concerns with the ending, I sometimes think I build things up too much! Awww, this sounds like the kinda book I really need to read!! Thanks for a fantastic review and for sharing this book I hadn't heard of before sweetie! Aw, this sounds like such a lovely book! If a heart-breaking one. It sounds like something I'd love, so thanks so much for the review, Carina--this one wasn't really high on my radar until I read this.